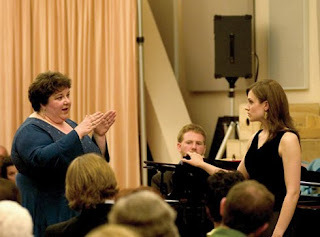 A little birdie told me that dramatic soprano, Jane Eaglen seems to be moving on from her Artist in Residence position at University of Washington (or U-Dub) and has accepted a teaching position at the Conservatory of Music of Baldwin-Wallace College in Berea, Ohio. While I was not able to confirm that Ms. Jane is actually leaving U-Dub, (as opposed to merely adding the Baldwin-Wallace position to her current schedule) one might deduce this from the content of the email highlighted below. In addition, part of the speculation that she is leaving U-Dub comes from a rumor that the Opera Program at University of Washington is closing down. But, a quick search on this netted zero. Do any of you, Friendlies, have any confirmed info on the closure? If so, either send me an email or comment below - the comments can be anonymous [wink]. I am pleased to announce that Jane Eaglen has agreed to join our Conservatory of Music voice faculty in the fall. Ms. Eaglen is a passionate and committed teacher coming to Baldwin-Wallace from the University of Washington, School of Music where she has served as a Senior Artist-in-Residence since 2006. As a performer, her reputation is second to none. 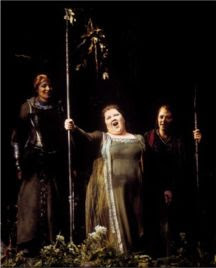 She has sung a wide variety of opera roles around the world including the Metropolitan Opera, Lyric Opera of Chicago, English National Opera, Seattle Opera, Teatro alla Scala, Wiener Staatsoper, and Scottish Opera among others. She has partnered with such fine singers and conductors such as Christine Brewer, Deborah Voigt, Plácido Domingo, Ben Heppner, Luciano Pavarotti, José van Dam, Simon Estes, Bryn Terfel, Claudio Abbado, Riccardo Chailly, Sir Andrew Davis, Sir Colin Davis, James Levine, Kurt Masur, Zubin Mehta, RIccardo Muti, Sir Roger Norrington and Gerard Schwarz. It will be a pleasure to welcome Ms. Eaglen to Northeast Ohio to join our distinguished Conservatory voice faculty. It is clear that she will add to the rich opportunities for our students and audiences in the Conservatory, College and community. I have indeed accepted a Professorship at Baldwin-Wallace College in Ohio. The position of Artist-in-Residence will no longer exist after this quarter, so yes I will be leaving the UW, sadly ... I am very excited to go to a Conservatory of Music where there is a lot of enthusiasm and the potential to develop an already very highly thought of program. I was very impressed by the people, the place and the exciting vibe there. I will, of course, be continuing to perform, and am looking forward to combining two things I love...performing and teaching. Thank you. Thank YOU, Ms. Jane... and PS: I fully heart your Turandot.